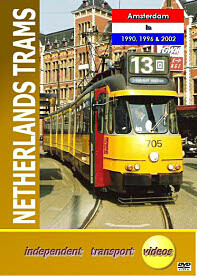 The Dutch city of Amsterdam is noted for its yellow liveried trams for many years. Trams have plied the streets of this historic city since 1875. This DVD gives you a flavour of the fleet in a period from 1990 to 2002. Our programme starts in 1990 with some archive video footage from the collection of Bob Webster. Filmed in various locations in central Amsterdam we see the familiar Schindler cars, Werkspoor cars and Belgium built BN cars in regular service. We then move forward a few years to 1996 where we present footage from the independent transport videos archive, filmed mostly in central Amsterdam. In the third section, our cameras visited Amsterdam in 2002 for a more intense look at the tram operations. Here we can witness the gradual change in livery from the familiar yellow hue to the latest white and blue scheme. It also fits in with the introduction of the latest Siemens Combino low floor trams that entered service in 2001. Our locations include; Centraal Station, Stadhouderskade, Damrak and central Amsterdam. We also have short rides on LHB car 792, Siemens car 2007 and Werkspoor car 673. We then take a brief visit to the East Anglian Transport Museum to see former Amsterdam 474 in action. This excellent museum at Carlton Colville in Suffolk is home to many fine trolleybuses and trams mostly from the UK, but also other parts of Europe. Our programme concludes with a Photo Gallery of Amsterdam trams from the camera of Brian Speller. The photographs were taken over the years from 1993 to 1995 and depict some of the trams seen in service elsewhere on this programme. It also includes a photo of a Duisburg (Germany) tram on demonstration with the Amsterdam undertaking. An interesting and varied DVD for your enjoyment, filmed in a vibrant city full of life and great interest for the transport enthusiast. Duration : 60 minutes (approx).